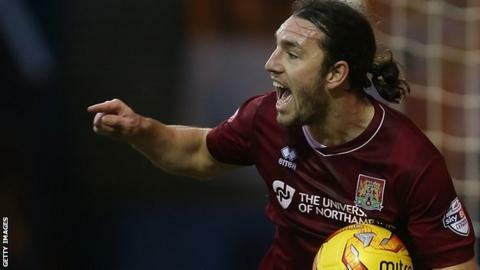 League Two leaders Northampton Town were held to a second successive draw at home to AFC Wimbledon. The Cobblers, whose 10-game winning run came to an end with a 0-0 stalemate at Hartlepool on Saturday, still saw their advantage at the top extended to 11 points after Plymouth's loss at Barnet. John-Joe O'Toole scrambled Joel Byrom's corner in at the far post to put the hosts ahead on the stroke of half-time. But Lyle Taylor's fine right-footed curler rescued a point for the Dons. Wimbledon remain eighth in the table, one point adrift of the final play-off place, while Northampton are still 19 points clear of fourth-placed Accrington Stanley. Chris Wilder's side have lost only one of their last 21 league matches, a run that stretches back to 17 October. "What a game of football. I thought it was two really, really good teams who went hammer-and-tong. "I'm proud to be a part of that game and certainly we deserved at least a point from it. "The energy, the commitment - I thought that was a really good advert for League Two. Two of the better teams in the league going toe-to-toe." Match ends, Northampton Town 1, AFC Wimbledon 1. Second Half ends, Northampton Town 1, AFC Wimbledon 1. Attempt missed. John-Joe O'Toole (Northampton Town) right footed shot from outside the box is high and wide to the right. Ricky Holmes (Northampton Town) wins a free kick on the left wing. Corner, Northampton Town. Conceded by Barry Fuller. Substitution, AFC Wimbledon. Sean Rigg replaces Andy Barcham. Substitution, AFC Wimbledon. Adebayo Azeez replaces Lyle Taylor because of an injury. Andy Barcham (AFC Wimbledon) wins a free kick on the right wing. Luke Prosser (Northampton Town) wins a free kick on the right wing. Corner, AFC Wimbledon. Conceded by Luke Prosser. Attempt blocked. Andy Barcham (AFC Wimbledon) left footed shot from the right side of the box is blocked. Corner, AFC Wimbledon. Conceded by Adam Smith. Attempt saved. Andy Barcham (AFC Wimbledon) left footed shot from the left side of the six yard box is saved in the bottom left corner. Attempt blocked. James Collins (Northampton Town) left footed shot from the centre of the box is blocked. Corner, Northampton Town. Conceded by Dannie Bulman. Attempt blocked. Andy Barcham (AFC Wimbledon) right footed shot from the centre of the box is blocked. Attempt missed. Zander Diamond (Northampton Town) right footed shot from the centre of the box is close, but misses to the left. Corner, Northampton Town. Conceded by Andy Barcham. Attempt blocked. Ricky Holmes (Northampton Town) right footed shot from outside the box is blocked. Lawson D'Ath (Northampton Town) wins a free kick in the defensive half. Attempt missed. Tom Elliott (AFC Wimbledon) right footed shot from the centre of the box is close, but misses to the right. Substitution, Northampton Town. John Marquis replaces Nicky Adams. Attempt saved. Paul Robinson (AFC Wimbledon) header from very close range is saved in the top centre of the goal.